Minolta actually opened shop in 1928 using the name “Nichi-Doku Shashinki Shoten” (which means Japan-German camera-vendor) by its founder, Kazuo Tashima. 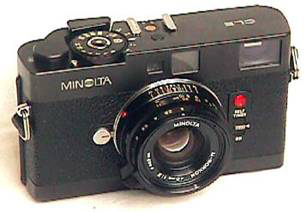 Thankfully, the name was later shortened to Minolta (Mechanism, INstruments, Optics and Lenses by TAshima) in 1931. 1929. The Nifcalette was Minolta’s first camera, brought onto the market in Japan in the year of the company’s inception (1928). 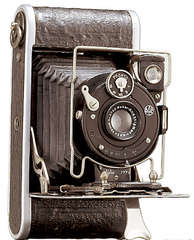 The Nifcalette was a folding roll-film camera with the format 40×65 mm. It had a lens and a diaphragm shutter manufactured in Germany. 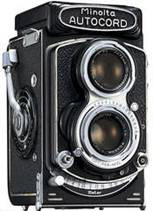 The Autocord, a twin-lens reflex camera that took roll film (larger format than 35mm). This camera was produced from 1955 to 1972 with very few changes. 1958. 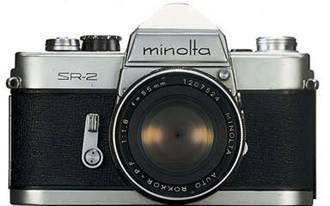 Owing to the success of other manufacturer’s Single Lens Reflex (SLR) cameras, Minolta introduced its SR-2 camera with a whopping selection of 3 interchangeable lenses. It had no meter, needed no batteries, and the viewfinder would stay dark until the film was wound. This lens mount would endure, unmodified, for 27 years until the introduction of the A-mount (autofocus) camera bodies. 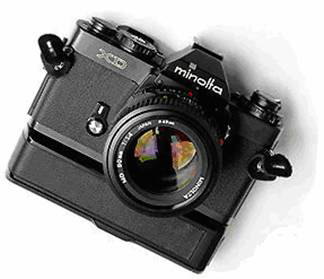 The old manual-focus lens mount design is still flourishing; it’s being used by the Seagull camera company of China under license from Minolta. Only a prototype from 1966, the Auto-Zoom-X featured a 30-120mm zoom lens with aperture-priority exposure and autowinding, and used 16mm film. 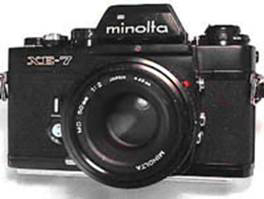 (This was the start of Minolta’s frequent use of the name “X” within their model numbers.) The batteries and shutter release were located in the grip. Ideas from this design were incorporated into Minolta’s Dimage Z-series digital cameras. 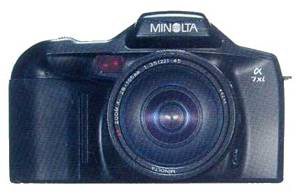 Minolta SRT-101. A classic by anybody’s standard. The most successful SLR-model of its time. Fully manual with built-in CLC light metering. Can use it in Siberia in the wintertime. Mine still works after years of hard use! 1962. John Glenn blasts into space on board the Friendship 7, America’s first manned spacecraft to orbit the earth with the ‘Right Stuff’ — a specially modified Minolta Hi-Matic camera. Note how the camera is used upside down with a folding viewfinder mounted to the base of the camera. 1972 –Leica collaborates with Minolta in the introduction of a more modern, smaller and affordable rangefinder camera. 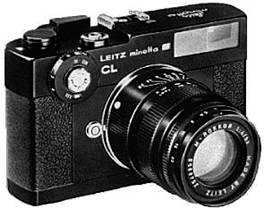 The Leica CL, Minolta CL, Leitz-Minolta CL and later the Minolta CLE are a result of this collaboration. 1972 Minolta XK decided to take on the immensely successful Nikon F2 professional camera by offering their version with the same features (more accurately: they blatantly copied the Nikon design) and going one better: In addition to rugged construction and interchangeable finders and focusing screens, Minolta added aperture-priority automatic exposure to the design, making it the most advanced professional-caliber camera body in the world at the time. Pictured here is the XK motor, an even higher-end camera which could meter between exposures at 3 frames per second – a feat no other camera in its day could achieve. 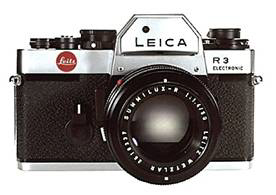 Minolta also produced the R3, R4 & R5 models for Leica. 1978 – XD11. The world’s first camera with both aperture-priority, shutter-priority, and program mode exposure (although the Program mode wasn’t highlighted in the marketing literature until after Canon’s success of the AE-1 Program camera.) This camera was also the basis of the Leica R4 and all of its successors, and is considered by many to be Minolta’s best quality (and smallest!) manual-focus SLR. 1981. 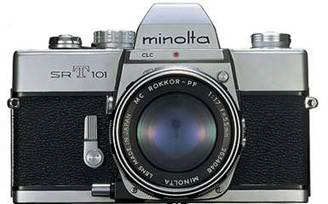 The Minolta CLE was based on Leica’s popular rangefinder format (accepting most of Leica’s legendary M-series lenses), but brought it into the modern world by adorning it with automatic aperture-priority exposure and automatic flash exposure. It took Leica almost 20 years to offer something as advanced. 1985 – DR-1000 Remote Light Meter Release – Here’s a very useful idea that was way ahead of its time. Let’s say you’re a professional photographer about to take a group picture. Your camera is mounted on a tripod with a long telephoto lens. You take your Minolta-brand handheld light meter (hey, I told you that you were a professional!) to measure the light hitting the subject (a more accurate way to meter when everyone’s wearing black suits). If this had been an ordinary camera, after taking the reading you would have to walk all the way back to the camera and manually dial in the f/stop and shutter speed that your handheld meter recommended, and then you’d press the shutter release to take the picture. But wait! What if you could do all that without having to walk all the way back to your camera? 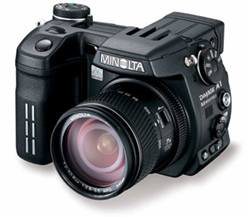 Using Minolta’s Flashmeter IV and the rare DR-1000 data receiver, you could push a button and the exposure settings would be electronically transmitted to the camera by an Infrared data link. Pushing another button on the light meter would then tell the camera to take the picture by remote control. Brilliantly useful. 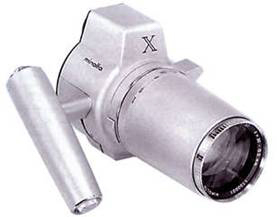 1992 – The entire xi-series product line was an ambitious user interface experiment which sought to turn the camera into a Macintosh. That is, just as the Macintosh allowed people who knew nothing about computers to get things done, Minolta created a series of cameras to allow people who knew nothing about photography to take good pictures. 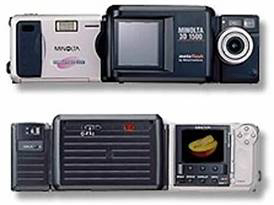 This was an interesting chapter in Minolta’s history, as even the cameras’ target demographic didn’t see much value in the new features – “intelligent” auto-zoom, little cards you could insert to tell the camera what kind of a picture you wanted, and lenses with zoom motors inside. All of the innovations from that period have faded away, sans two: the new, improved flash hot shoe, and (thankfully) the wireless flash system, which I write about extensively in my books. 1995 – RD-175. 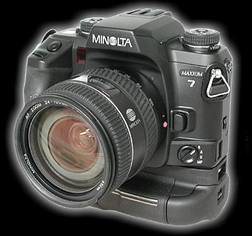 The Minolta RD-175 was a pioneering 1.75 megapixel DSLR camera based upon Minolta’s Maxxum lens mount. Built around their 400si film camera body, it used 3 video chips with a 3-way beam splitter and “stitched” all the images together in software to achieve a reasonably high (for its day) resolution at a competitive price. 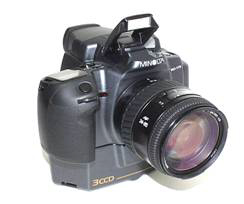 1999 – RD-3000 The same innovative 3-sensor approach used in the RD-175 was also used in the 3 megapixel RD-3000 digital camera, one of the best digital cameras you could buy at the time. To minimize the crop factor (due to the small size of the sensors), this DSLR used Minolta’s APS-series “Vectis” interchangeable lenses, NOT the more popular Maxxum lens mount. A much-improved “hot shoe”. You don’t appreciate this unless you shoot under pressure. The traditional flash mount on every other camera is based on a design that dates back to at least 1940. 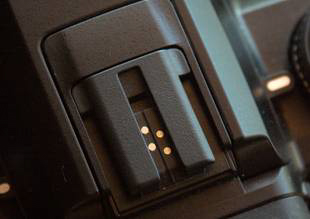 It has become problematic because as time went on, more and more electrical contacts have been added to the standard shoe mount to allow flash automation. The first problem with this design is it takes between 5 to 10 seconds to mount or remove the flash and then secure it by screwing down a retaining nut. The second problem is that if you did not secure it properly (and sometimes even if you do), as you run around the flash might slip a little in the shoe mount, resulting in either no flash or horribly overexposed flash pictures. This has happened to more than one wedding photographer that I know of back in the days of film, when you didn’t become aware of this kind of failure until after the pictures were developed. Few recognize this as being a problem. 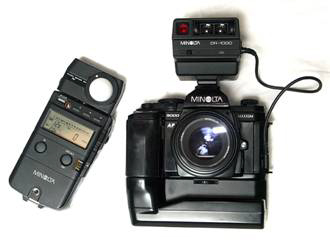 Minolta engineers not only recognized it, but also addressed the problem by completely redesigning the hot shoe. Now it can easily and surely slide on and off in less than one second, and I have never, ever had the flash fail because of a poor fitting! 1999 – An obscure brush with genius. 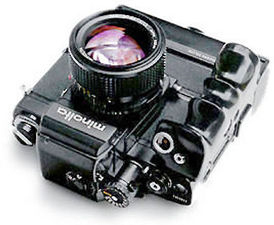 This was a specially modified Dimage EX Zoom 1500 camera with a MetaCreations add-on which enables it to take a picture of an object and have it show up in the computer as a fully-rendered 3D model, ready for a design modification or a virtual reality realization. They also made a larger, industrial-strength version that did the same thing but faster. 2000 – Maxxum 7 – Ask anyone who’s used one, and they’ll tell you this has the best user interface of any autofocus SLR. You really have to use this camera day in and day out under high-pressure shooting conditions (like photographing weddings, which I did) to appreciate all the subtle design nuances that this camera offers. The most innovative feature was the display on the back, showing you all of the camera’s settings at a glance, and allowing you to see in plain English what every custom function does and what it’s set to. The display also provided a brightness range map to those who wanted to see beforehand which parts of the scene would fall where in the range of tonal values. These subtle-yet-useful improvements may be obvious in retrospect, but Minolta engineers were the first to think of them. 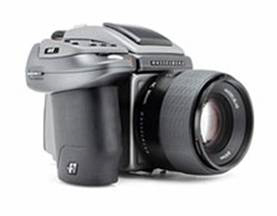 2002 – Hassleblad H1. 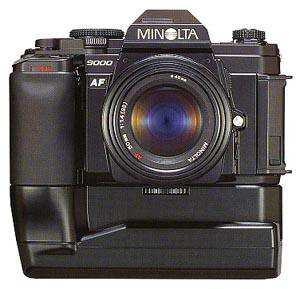 What has Minolta got to do with a medium format classic? They had lended their expertise in autofocus and extremely bright focusing screens to Hassleblad (who lacked such expertise inhouse) in the creation of their new H1 645-format roll-film camera. 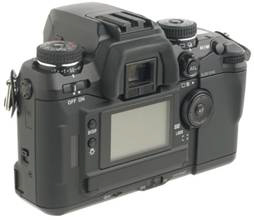 2003 & 2004 – Dimage A1 and A2 digital cameras. 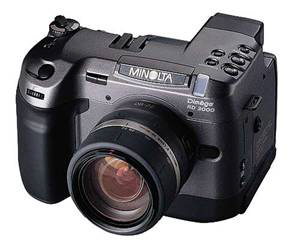 Minolta was the first to offer a digital camera with a real 28 mm wide angle lens (and was the only one to do so for several years after that), they were also the first to offer its unique Anti-Shake technology. The lens and overall image quality of the cameras have won accolades worldwide, and I was so impressed with them that I wrote a book describing their use!